The Rotated Turbo Tuner kit is designed around the customer who already may have a turbo, and or a wastegate,and is looking to install them onto their WRX or STI. As long as you have one of our supported turbos and wastegates, you can get the same level of performance offered in our complete Rotated Turbo kits. Every kit includes all necessary items (except turbo and wastegate) to install on your WRX/STI (with Front Mounted Intercooler.) With many years of production under out belts, you will feel confident that this kit will last and perform. PERRIN Turbo kits are not for the faint of heart and it is best to speak to a PERRIN specialist before ordering. Let us help choose the exact combination of turbo and exhaust housings to meet your needs. We can help you choose the extras that make this project successful from things like ECU tuning tips, recommended engine internals, injector size, fuel pumps, etc. PERRIN Rotated Turbo Tuner Kits are designed for customers that are looking for 400+HP but may already have a turbo or wastegate. This option allows customers an inexpensive way to get into our turbo kit or allows them to build their car part by part. Like our complete kits these tuner kits are designed around Garrett GT30R, GTX30R, GT35R and GTX35R turbochargers, which can support 600+ Wheel HP! Each kit includes Intake system, 3” downpipe, boost tube connection for Front Mounted Intercooler, and all other parts needed for installation for those who already have a Front Mounted Intercooler. The stock location for the turbo is limited by its narrow pathway for the intake which travels under the intake manifold. This narrow path is no where large enough for 3”-4” intake systems to function. By rotating the turbo off to the side, this allows for a larger intake, makes a smoother transition from the Up-pipe to the downpipe, creates space for a large external wastegate, and of course almost any size turbo we want. The PERRIN turbo kit places the turbo in the optimum position to attach to almost every aftermarket front mount intercooler as well as clear all OEM parts ensuring no damage from the extreme temps. How much Horsepower will this support? The PERRIN Rotated Tuner Kits are able to produce as much HP as the turbo you choose allows. If you are buying this kit and choosing your own turbo, keep in mind the kit is designed to work with turbos ranging up to 750 engine HP. 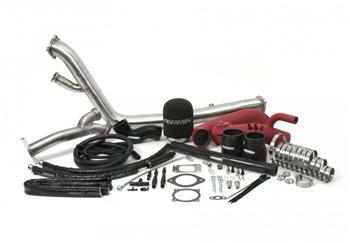 If you interested in buying a turbo from us, give us a ring and we can help you decide which one fits your needs best! Every kit comes with a 3” cold air intake system that reaches down to your inner fender to supply fresh cold air to your Garrett GT turbo. Each intake includes fittings for all your crank case breathers and hoses. Each intake includes a modular BigMAF housing, which allows the use of a pull through or a blow through MAF setup. See more info about our» Blow-Thu MAF tube on our site and learn how this can be a vital part of your installation. PERRIN intake systems always include a high flow foam filter element, perfect for large turbo applications. Also included are silicone adapters, and vacuum hoses for the installation. Our Rotated turbo kit up-pipe is TIG welded, CNC mandrel bent, 2” 304SS tube with .500” CNC cut flanges. The external waste gate is plumbed into the up-pipe with a smooth transition, from up-pipe to wastegate, allowing for increased exhaust flow and perfect control of all boost levels. The up-pipe is designed to bolt to a factory exhaust manifold or PERRIN headers, and fit a T3 Turbine housing from a Garrett GT30R, GTX30R, GT35R or GTX35R. Our downpipe features a wastegate dump tube to recirculate exhaust gases back into the exhaust system. This eliminates the risk of fire and melting underhood components from high heat rushing from the wastegate. Our competitors don’t offer this level of safety and performance, instead choosing to dump those raw gases directly into the engine bay. The PERRIN downpipe dump tube features a slip fit that allows for quick removal of the downpipe. Like our other exhaust components, the downpipe is TIG welded, CNC mandrel bent, 3” 304SS tube with .500” CNC cut flanges. It is also designed to bolt up to your PERRIN or OEM cat-back exhaust. The Tuner Kit does not included a wastegate, but its designed around the popular Tial 44mm and Precision Turbo 46mm wastegates. Both of these wastegates are v-band inlet and outlet designs that are 100% interchangeable with our kits. Other V-band style wastegates like the Turbosmart Compgate 40 also fits along with other. Before purchasing, we recommend contacting the manufacture to ensure proper fitment.